on Friday, 06 October 2017. On 29th September 2017, the African Centre for Global Health and Social Transformation (ACHEST) together with CSOs working on the health agenda in Uganda; in partnership with the Uganda Parliamentary Forum on Quality of Health Care held the First National Presidential Dialogue on Quality of Health Care at Collin Hotel in Mukono. The dialogue that was premised on the theme: Improving Health Service Delivery to Ensure Quality Care for all brought together more than 800 participants from: Civil Society Organizations, Religious Institutions, Government line ministries, Members of parliament, students, academia and the media. Prof. Francis Omaswa signing an autograph on his African Health Leaders HandbookProf. Francis Omaswa, the Executive Director of ACHEST while giving a keynote speech titled: Quality mindset urged Ministry of Health of Uganda to create a managerial structure that brings together players in the health sector, line ministries including health, finance, gender and education to harmonize health related issues. “Planning for health workers through; development, recruitment and their deployment should be done jointly so that the health workers can be shared by all districts across the country. It is sad that the Human Resources for Development position at Ministry of health has not been filled for years, this post needs to be filled immediately.” Prof. Omaswa implored. The First Deputy Prime Minister, Gen. Moses Ali who represented President Yoweri Museveni at the closer of the Dialogue expressed worry about communicable diseases which he likened to cancer and diabetes that come with age and remain a big challenge, but noted that health workers play a great role in addressing the challenge. “As Ugandans seek quality health, there is need to encourage them about personal hygiene and good sanitation.” Moses Ali recommended. The Minister for Primary health care Dr. Joyce Moriku expressed discontent with the increase in teenage pregnancies noting that they have risen from 24% to 25% nationwide and they could get worse. “We need youth friendly, supportive and understanding services since the greatest population of the country comprises of the youth, but it should be noted that issues of teenage pregnancies are at family level and the families together with cultural and religious leaders need to jointly help the situation.” Dr. Moriku added. The Dialogue that was taking place for the first time was launched by the First Deputy Prime Minister and declared to be an annual event that will be deliberating on Quality of Health Care in Uganda. ACHEST was co-chaired the organizing committee of the Dialogue; and exhibited and disseminated information materials to the participants at the Dialogue. ACHEST was represented at the 2nd Uganda National Family Planning Conference that took place at Kampala Serena Hotel from 26th-27th September 2017. The conference was premised on the theme: ‘Universal access to family planning for healthier and empowered communities; towards social and economic development’. Speaking during the second National Family Planning Conference at Kampala Serena Hotel, Dr. Jane Ruth Aceng, the health minister said, the Government is committed to scaling-up family planning programmes to create demand, especially in hard to reach areas. “The ministry plans to increase the accessibility of modern contraceptives up to 50% and reduce the unmet need for contraceptives in our vision 2020 to 10% from 34%,” Aceng said. The conference that was attended by over 1000 participants from Uganda and beyond was a great success. We hope you got the best out of all the sessions that were organized and the speakers who aided the discussions. The 2011 Uganda Demographic and Health Survey, indicates that more than four in 10 births are unplanned. This is partly attributed to a high unmet access family planning gap, in which three in every 10 women do not access family planning. 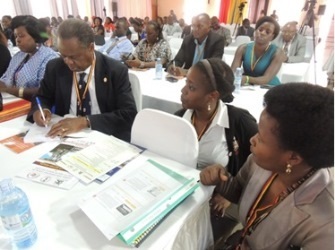 Alain Sibenaler, the United Nations Population Fund (UNFPA) country representative, said the theme is pertinent for Uganda as it looks towards attaining middle-income status. “Access to voluntary family planning is a human right and is one of the most critically important investments that we could make in health, in women’s rights and in the life trajectories of young people,” Sibenaler said. ACHEST in partnership with Coalition for Health Promotion and Social Development (HEPS-Uganda) and Amref Health Africa in Uganda under the Health Systems Advocacy Partnership project got a stall where they displayed the project information materials developed by the trio.